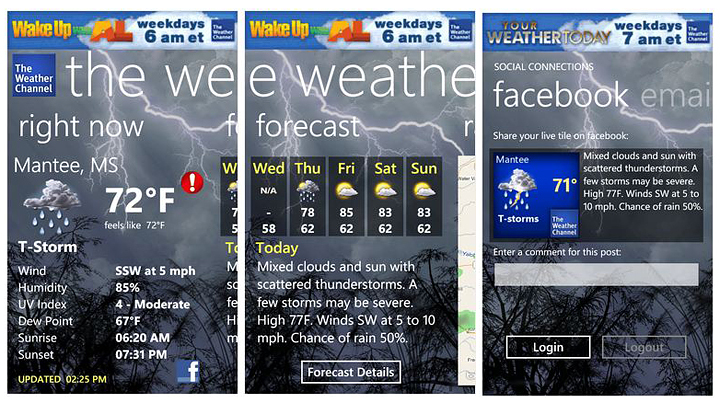 When smartphones were released to the market, a popular application users were installing was a weather application. There are a lot of weather applications out there, that come with information about the current weather and upcoming forecast. By installing one of these applications you will have an idea if you will be able to have a barbeque party on the upcoming weekend or not, or what clothes you should wear when you wake up and you’re about to leave for work. By just glancing at the app or widget you will be able to prepare yourself for the day. Below we’re going to talk about some top weather applications that are used by millions of users. 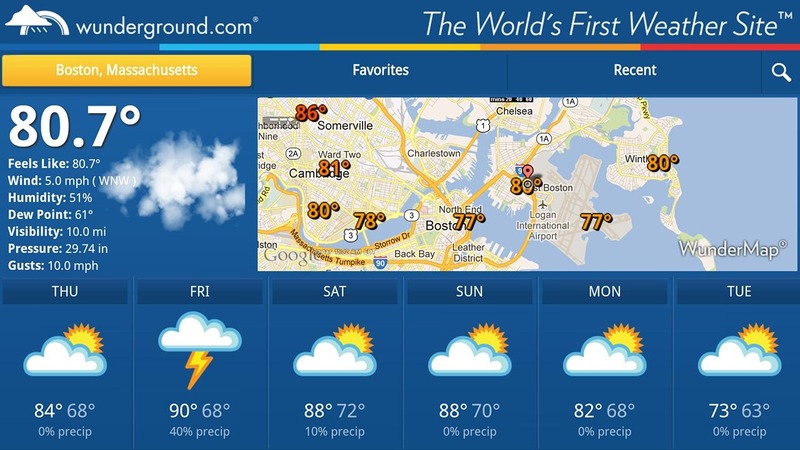 It seems that the developers behind the AccuWeather application have worked pretty hard to make sure that they released a clean user interface. AccuWeather application doesn’t come only with the current weather activity such as rainy or sunny but it also includes the pressure, humidity, wind speed and direction data etc. AccuWeather is also trying to provide detailed precipitation forecast for the upcoming 120 minutes, called MinuteCast. By joining MinuteCast you will be able to see hourly and daily forecasts, radar maps and more. Weather Underground (also known as Wunderground) comes with a simple white background. While navigating on the main screen of the application you will notice the current condition data and a small radar inset that can be tapped to open it. There is also other weather information such as: winds, data, precipitation forecast and more. The application also features a forecast table that can also be toggled between hourly and daily, and other information such as pollen and UV, sunset/sunrise times. The main menu also gives you access to live weather radio station, ski reports and hurricane updates. 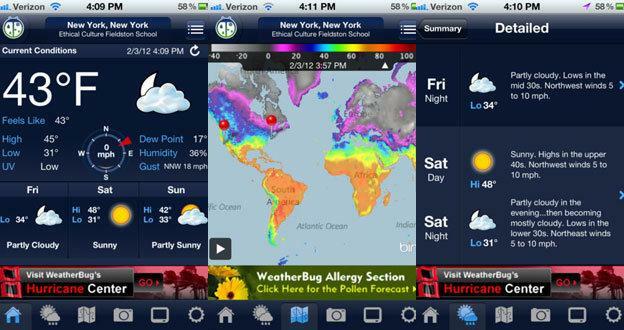 WeatherBug is used by persons who like to see a lot of weather details on their smartphone. You will be stunned by the weather information that you will get from WeatherBug. On the main page, you will be able to see the current weather conditions and a small radar inset. By tapping on the radar, you will enlarge it and you will be able to turn other layers on and off. While in the main screen, you will be able to slide to the right, to access weather details such as moonrise and sunrise information, precipitation, wind data and more. You will be able to see hourly forecast to make an idea on what’s about to come in the upcoming hours or even a 10-day forecast, to see how the weather will be in the upcoming days. Yahoo! 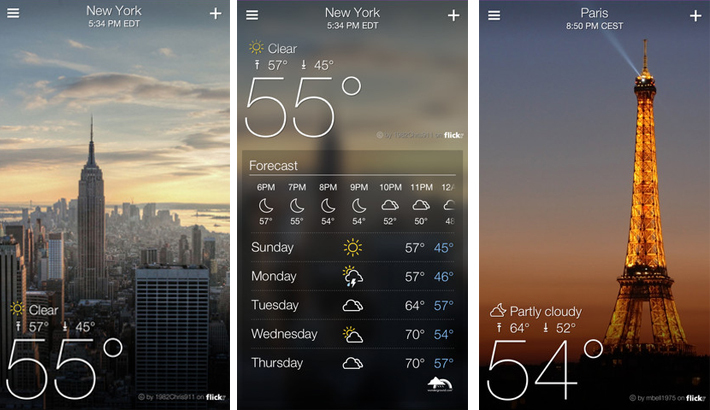 Weather is still one of the most used weather applications out there. Even if it’s pretty old, it seems that there are still a lot of people who prefer using it. The application comes with a very clean user interface, allowing you to clearly see the current weather without any problems. By using the left and right swipes, you will be able to see more information such as humidity, pressure etc. Aside from the current weather conditions, the users will be able to see the 5 or 10 day forecasts along with detailed information for the next evening or day. To make things even more interesting, the application comes with a map that shows a radar, temp, wind and satellite data. However, the downside of Yahoo Weather is that it doesn’t come with an animated radar map, which means that you will not be able to see animated movement of the storms over time. The Weather Channel presents you with information via a single vertically scrolling screen. 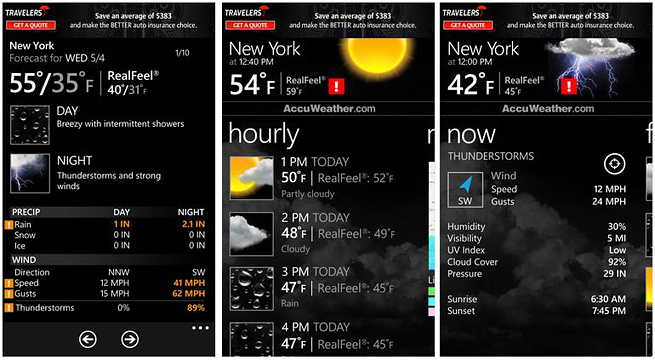 The application shows you some basic weather conditions, followed by more detailed data. In addition, you will be able to see the forecast for an upcoming 10 days, which is pretty much what most users are looking for. We agree that most users are installing this application for the current weather information, but there are a lot of other users who install it just to see how the weather will be in the next week, when they plan to go on a trip or something similar. The Weather Channel application comes with a radar function that features several alert layers such as: floods, winter weather, sever storm warning etc. Users are able to choose from data layers such as: clouds, temps radar, wind and more. The Weather channel also comes with other functions such as pollen count data, news, airport data and a flu report. Which weather application do you use on your mobile device? Next articleWindows 10 – Different and Better Than Windows 8 ?